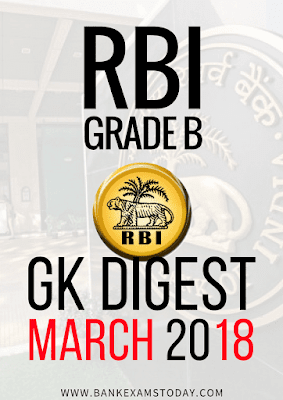 We have prepared the RBI Grade B GK Digest for the month of March 2018. In this digest, you will get the comprehensive summary of all the important notifications released by RBI. Also, we have included the important government schemes, monthly current affairs that are important for the exam. Unlike the previous RBI Grade B Digests, this month's edition will be available only for the students who enrolled in our RBI Grade B 2018 course.